Ok, we’re skipping around a bit. It’s been particularly chaotic in the last couple of weeks because both of us have been gone so much (between us we’ve been in Portland, San Francisco, New York, and Pennsylvania in the last 4 weeks!). Despite our chaotic schedules, we make sure to take some time to have fun. 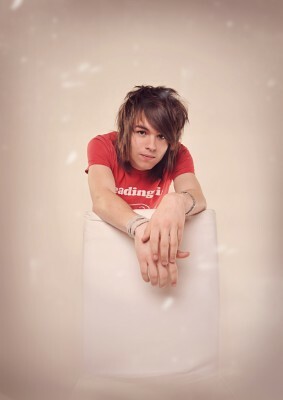 It’s a moderately well known fact that we have apartment theme music, by an artist known as The Ready Set. We even picked a specific apartment theme song. Really, you should go listen to the song. It’s excellent context for the rest of the post. Here's a picture to look at while you listen to the song. When we found out that The Ready Set would be playing a show in Seattle, we got moderately excited. Then we convinced fellow adventurers Tom and Alan to go to the concert with us, and bought tickets for the whole team. If you listened to the song and looked at the picture (or read the title of this post), you may be thinking the same thing Alan asked us: Will there be a bunch of teenage girls at the concert? It was unlike anything either of us had experienced before. There were screaming high school girls. There were even screaming middle school girls. Most of them were filming the action with their cell phones and their Nikon Coolpix cameras. The crowd was extremely excited about everything, and it really added to the energy of the show. There were sing alongs, and bouts of hopping up and down that made the floor shake, and at one point someone threw glowsticks into the audience (I got nailed in the face with one). Ellen and Alan were particularly taken aback by the horde of enthusiastic teenyboppers, but I personally thought it was great entertainment. The performers did a pretty good job of putting on a show (and sounded better than I expected) and having an excited crowd really adds to the experience. Besides, how many opportunities do you get to watch high schoolers in matching self-decorated shirts arguing over distribution of the posters they’ve collectively purchased? I’ve always wanted to back a project on Kickstarter. For those who aren’t familiar, Kickstarter is a website to crowd source funding for awesome projects. If a project gets the required amount of funding before the deadline, it goes through. If not, no one gets charged and it doesn’t happen. I’ve been meaning to get an account started to back things that I think are worthwhile. We finally came across something worth it with Kevin Tostado’s Monopoly documentary. Kevin was an Olin ’06er who also made a film while studying there, called Yellow Lights. The Monopoly Documentary was an entirely different type of film and has left me wanting to play Monopoly! 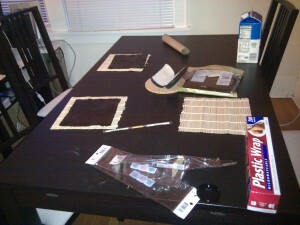 I still haven’t gotten to, so if you’re in the Seattle area and want to swing by Leon’s Flat for a game… let me know. In competitive Monopoly, you use a third, red die called the “Mr. Monopoly” die that requires you to move ahead to buy property, or move ahead and pay the owner the value (depending on game state). When you win competitive Monopoly you get the amount of money that comes with the game. Monopoly was originally a game called “The Landlord’s Game” and was supposed to emphasize how unfair capitalism was. First time we watched a documentary someone we know made! First time we learned about the monopoly championship. We got behind, and it was terrible. But we’re making up for it! This weekend we joined our friend Dana on a glorious snowcation* to Sunriver, OR. This allowed us to pursue classic winter activities like reading in front of a roaring fireplace, playing cards with friends, and falling into snow banks. Our first full day was pretty relaxing – we drove to Sunriver from Portland with Dana’s friends and spent the evening socializing and learning how to play cribbage. It’s a pretty fun game, if you haven’t played it before, and balances luck and skill pretty well. 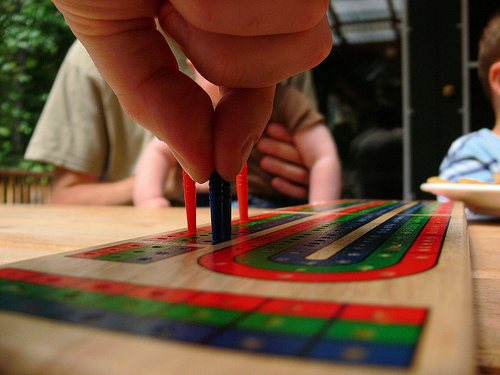 One of our new friends even set up a double-elimination cribbage tournament. Even though we had just learned the game Ellen and I somehow ended up duking it out for the title**. The next day we drove out to Mt. 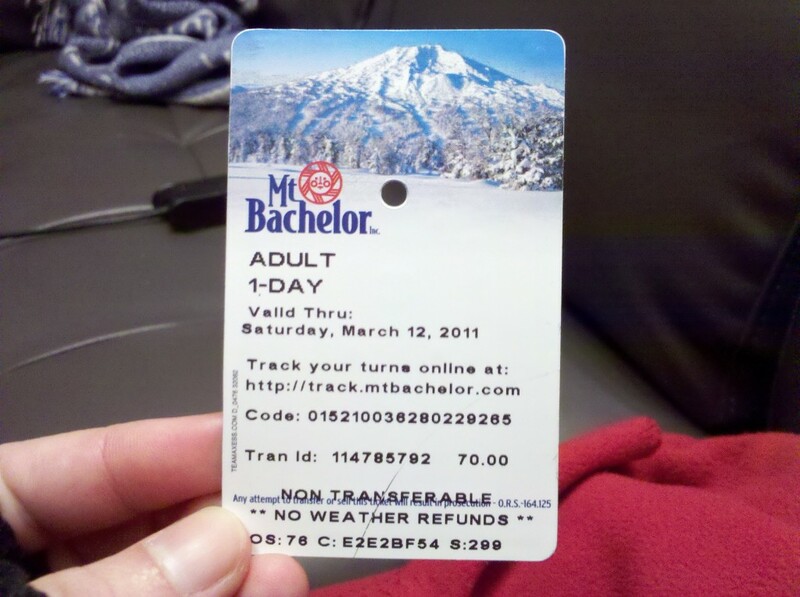 Bachelor and hit the slopes. Ellen and I aren’t exactly avid skiers. She’s gone exactly once before and never left the bunny hill, and I’d never skied at all. We believe in the principle of Do-Learn, though, so we gamely strapped on skis and followed our friends (they knew we had no experience, in case you’re getting worried). Proof that we did, in fact, go skiing. Nobody brought a camera on the slopes so it's all I've got. Despite our inexperience and a certain lack of skiing finesse, our friends decided to take us down a (relatively easy) trail. We made it all the way down to the top of the bunny hill, and then parted ways so that they could ski some more difficult trails and enjoy themselves more. 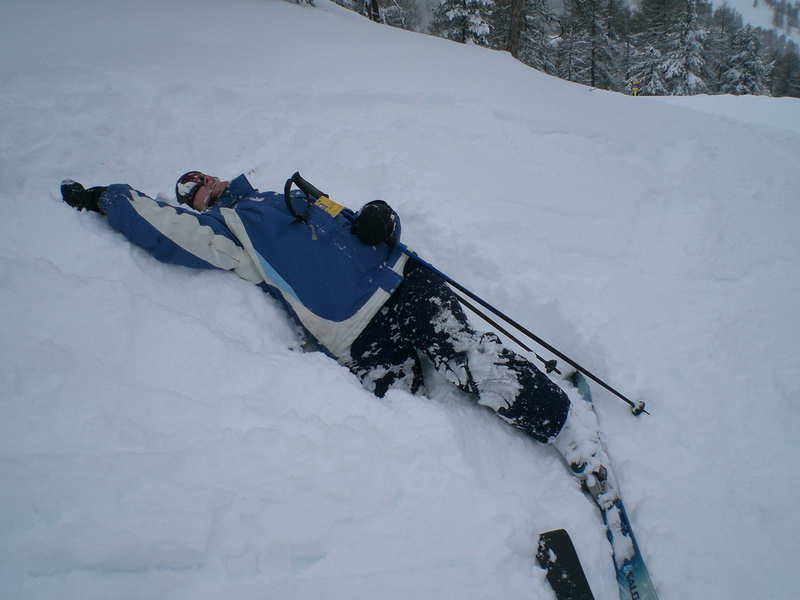 It ended up being a pretty interesting experience: I learned that skiing is difficult, occasionally terrifying, and very fun. 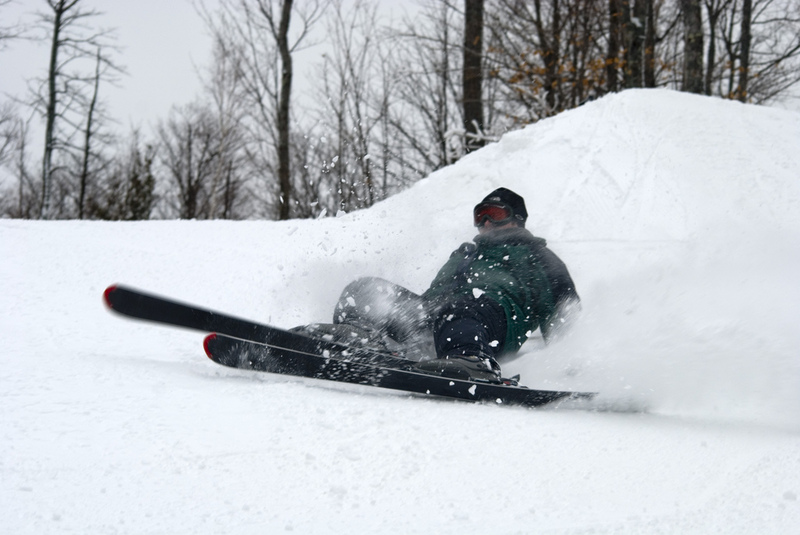 I would definitely try it again (although maybe keeping to the bunny hill a little longer). Week 7: No Social Media! So, we’re a bit behind. Forgive us. Nikki had the stomach flu, Ellen went to Michigan, things were generally chaotic, etc, etc. Don’t fear! There will still be 52 awesome things for project 52, even if we end up condensing a little bit. For week 7 we decided to do “No Social Media.” For Nikki, this meant giving up Twitter and Facebook for two weeks. For Ellen, this meant giving up Facebook for the month of February. There are, unfortunately, no real photos to indicate this achievement. This also seems to have varying effects on different people- Nikki told me to write this post because she didn’t notice too many differences. Being able to find out what books my book club was reading (mitigation- email or text someone from book club to ask). My mother missed being able to look at photos of me. Any messages sent straight to me. As someone who’d previously *hated* Facebook messages (why don’t you just email me?) I now understand why people just joining Facebook tend to use the PM functionality. Why? The rest of the site is completely overwhelming. When you’re looking at Facebook everyday, you’re getting updates and regularly know where to look. When you just open it for the first time… well… there’s chaos. My immediate reaction upon reactivating was “how did I ever use this?” Facebook basically just gives me one recurring case of “Fear of Missing Out” or “FOMO” as HBS calls it. Facebook definitely isn’t worth that anxiety. I know other people have mentioned that they felt like they had more time without Facebook- I genuinely didn’t notice this at all. Perhaps I never used Facebook that much, perhaps I wasted time on other things. Moving past no-Facebook-February, I’m not going to totally delete my Facebook, because I might need to contact someone that I only have information for on Facebook. For now, though, I’m just going to let my Facebook account sit deactivated, and not overwhelming me with all the things I’m not doing. I know, I know. I promised you an update on our week without social media, and we will post about that next week (we’ll even continue to abstain in the meantime). But this week was Ignite Seattle 13, and how could we miss out on that? For those of you unfamiliar with Ignite (and uninterested in the Wikipedia link I tossed out up there), a brief description: Ignite is an evening of 5 minute long presentations. Speakers prepare a 20 slide deck, with each slide set to automatically advance after 15 seconds. It’s very similar to Pecha Kucha, and tends to cover a pretty wide variety of topics. Although we liked each of these for a different reason, they were all well done presentations that made us think about something. Sure, telling a story about impersonating Neil Patrick Harris on Twitter may be a little less intellectually stimulating than Twisted Monk’s business talk (which, while delving slightly into the NSFW, gave excellent advice). Maybe being reassured that we can still call a Triceratops a Triceratops wasn’t quite as provocative as the idea of adults, even with families, co-housing (or vise-versa depending on your point of view). Nonetheless, the talks at Ignite all had a point, from improving karaoke technique to having fun traveling Disneyland alone. More importantly, the talks were exciting and energizing. They led perfectly into enthusiastic (and sometimes heated) conversations over various points brought up in the talks, which perfectly blended an evening of casual entertainment with serious thought. If you’ve never been to Ignite, you should definitely look up events near you! We had a special guest visitor for this week’s episode of Leon’s Flat’s new things. 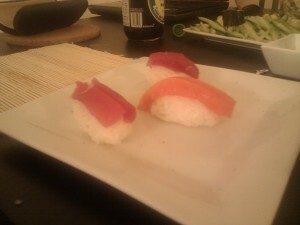 Garrett flew in to visit us from Milwaukee, and he was very interested in making sushi. 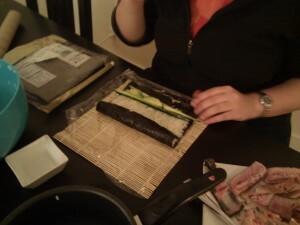 So, we had an excellent sushi purchasing and making adventure. Uwajimaya – sushi mats, seaweed, rice vinegar, japanese mayonnaise, siracha, miscellaneous hilarious beverages (like curry soda), etc. Pike’s Place Market – fish! Safeway – Avocado and cucumber. Our sushi mats and seaweed! Be careful, Seaweed is expensive! 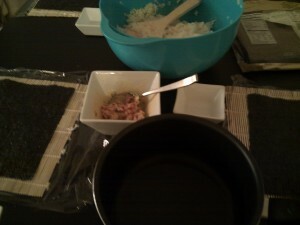 We even made spicy tuna using Bryce's recipe (well, we adapted it). Rolling the sushi on the sushi mat. Using saran wrap made it way harder. No one can claim Nikki isn't a yuppie! 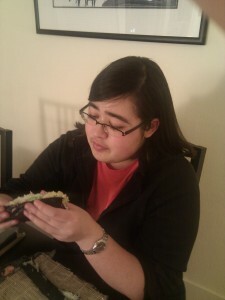 She ate a sushi burrito like the best of them. 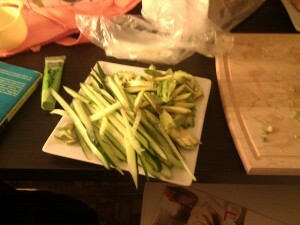 (Sushi is hard to make stick). Sushi that looks more like sushi should! Conclusion: it's easier to make this kind look pretty than is to make rolls look pretty. 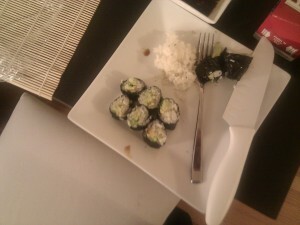 We aren’t really sure if it’s cheaper to buy sushi at a restaurant, or make sushi, but it is more fun to make sushi! Blue ended up being an extremely popular color. Even more interesting was how close Loopt, Twitter, and Foursquare were to the shade of blue we chose for Gatehopper. It is a very cheerful color. Week four found us people watching in Trabant Coffee & Chai in the University District. We started out watching one thing: what do people do when they enter the cafe? We focused on if they knew where the counter was, if they knew what they wanted to order, and how they interacted while waiting for their drink. We noticed that there are differences between regulars and new customers. Also, since we were in a balcony it became obvious they didn't look up. We also realized that individuals who were regular coffee drinkers were better at seeming nonchalant, if not friendly. For instance, we had a hard time discerning if quick orders of “12 oz nonfat latte” were regulars, or just knew how to unambiguously order coffee. Moving on from people watching we also learned it was good design inspiration for further conversations. 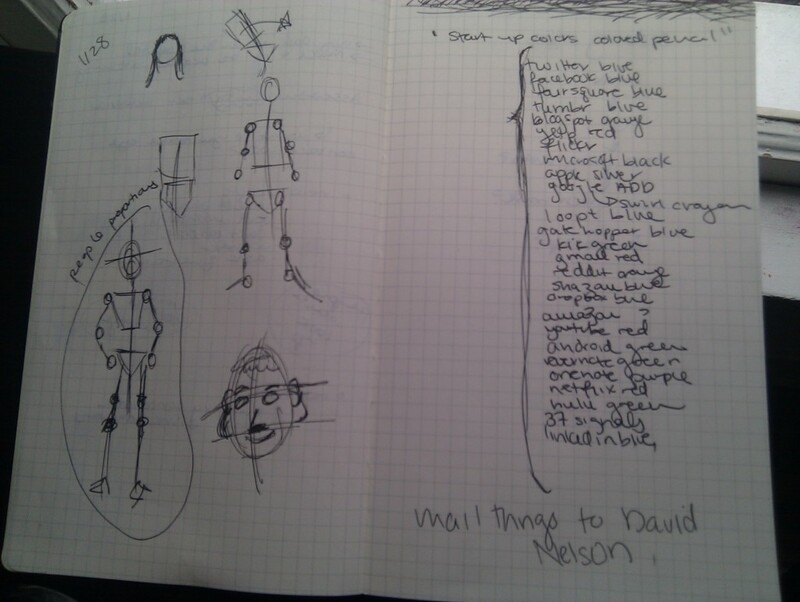 For instance, we practiced drawing people (Nikki knows how, and tried to teach me). Additionally, we started talking about the color of the coffee cups in the shop, and realized it was the same shade of blue that we used for GateHopper, and that it was really similar to the blue used for Twitter, Foursquare, and other startups. This inspired us to make “Startup Colored pencils” as shown in the next entry. We practiced drawing people, and made a list of start up companies and their associated colors. 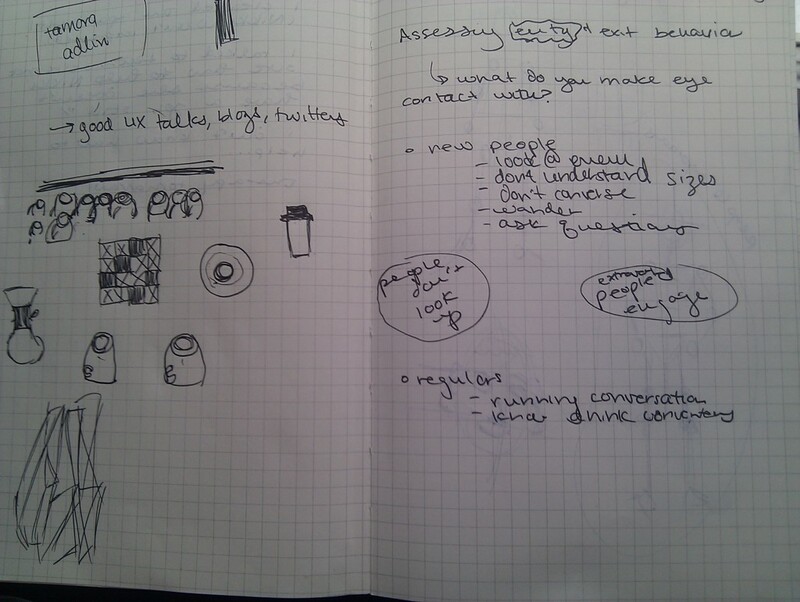 People watching is good design inspiration. Ellen and I are both right-handed. Extremely right-handed, one might say. We decided to challenge ourselves this week by being as left-handed as possible (barring important things like work and signing checks and such). After a pretty relaxed day hanging out with friends, we decided to come home and break in our new fondue pot. 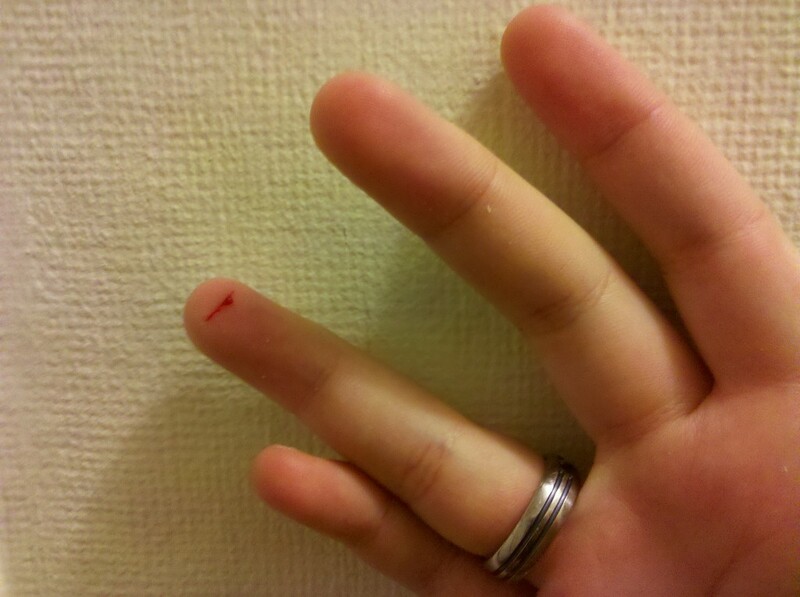 I promptly cut my finger open slicing bread. Left Hand: 1, Right Hand: 0. I did get to use a sweet Transformers band-aid, though. 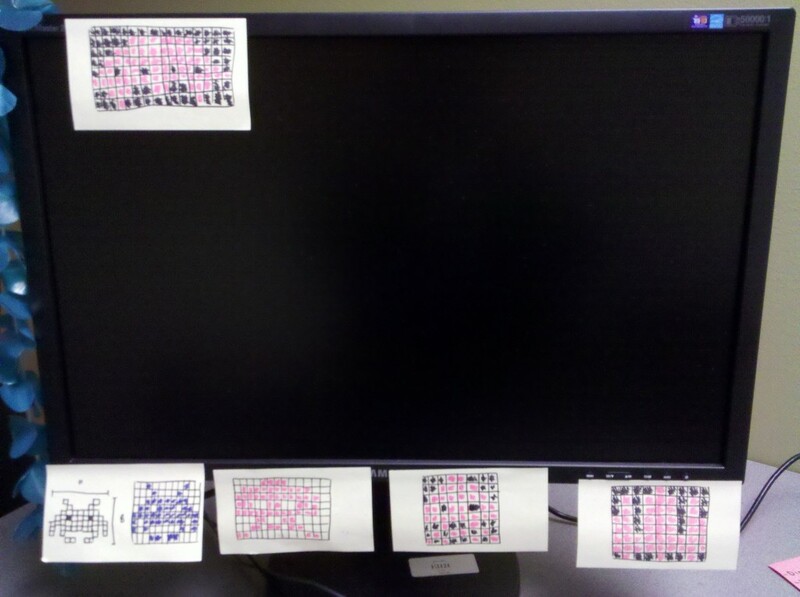 While working on part of Dropbox’s Dropquest, I found myself face to face with a Sudoku puzzle. Solving it on the computer proved annoying (they substituted the usual numbers for nonconsecutive letters), so I copied it out onto a piece of paper to solve. The results were messy, but legible. 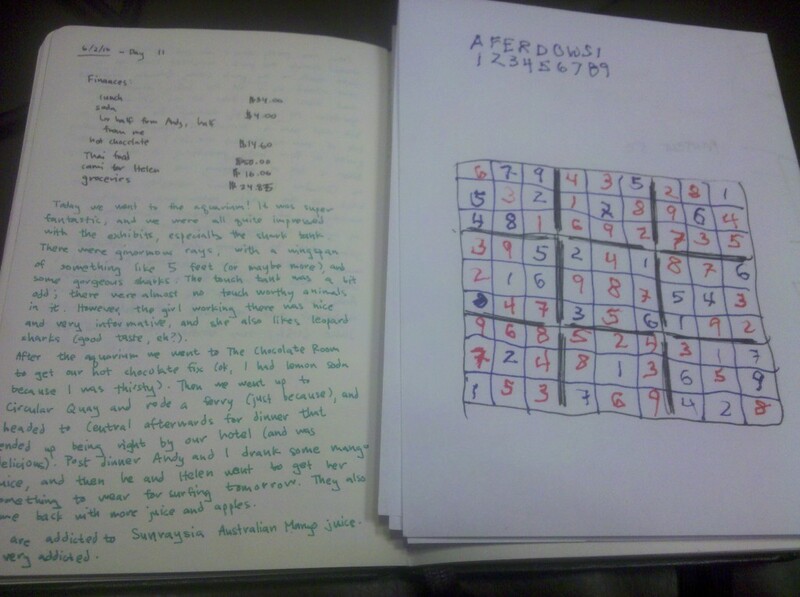 Compare my Sudoku puzzle to one of my notebook entries (notes from my trip to Sydney for the OCEANS'10 conference, if you're wondering). There weren't any injuries, so I'm going to count this as a victory. Even our kitchenware is right-handed! Cooking has become somewhat awkward, due to the combination of right-handed spatulas and natural right-handedness. I can see how this would be annoying even if I was naturally left-handed. On the positive side, I have perfected the art of chopping things left-handed. Or at least mastered not injuring myself. Washing dishes is also a little tricky, and things haven’t been getting quite as clean as I would like. I didn’t really think about dish washing as having a handedness, but it clearly does. Getting everything really clean is taking a lot longer because I’m slower at it and have to double check everything. I assume dishwashers are still pretty ambidextrous. Fortunately, my computer is pretty ambidextrous, since I mostly use it for typing. My smartphone is also reasonably easy to use with either hand. I have noticed that many apps right-justify buttons, making using my phone entirely left-handed somewhat aggravating. I’ve switched from using only my right hand to using both hands whenever I am interacting seriously with it. The week is winding up, and I haven’t been running into other big changes in my life. Small things like brushing my teeth, unlocking doors, and combing my hair are still clumsy and a little challenging, but not undoable. Cooking has become manageable but annoying, and I’ve been eating a lot of sandwiches and finger foods so that I don’t have to deal with our kitchen (and the subsequent dishwashing!). they realized that had an unsurmountable problem in building the Chumby- they lacked a soldering iron. 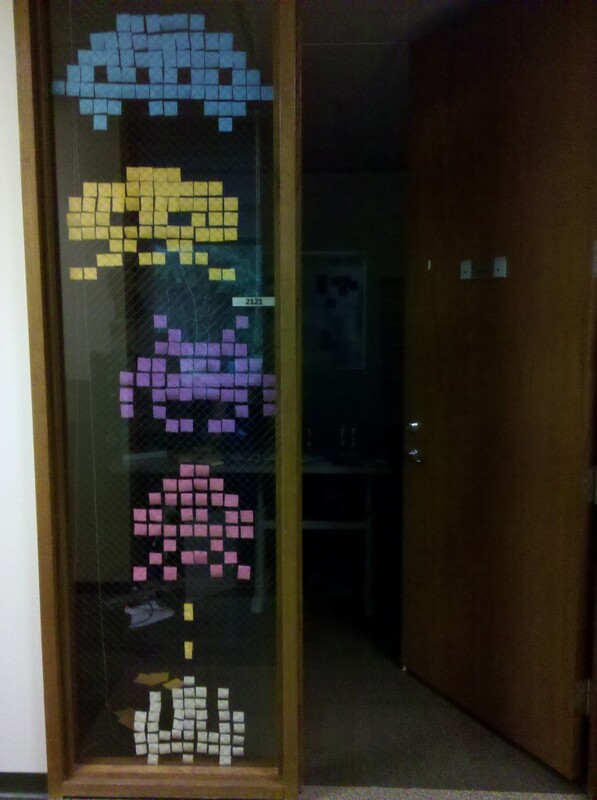 Not to be daunted, they quickly moved down the list to making “post it-note pixelated art in Ellen’s office.” They needed something relatively narrow given the shape of Ellen’s window, so they chose to do old-school space invaders. Planning! 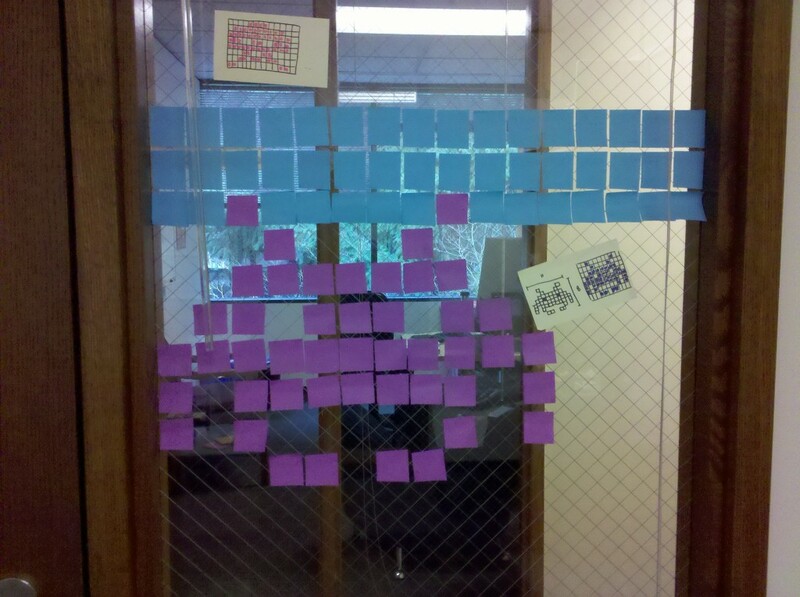 We started by analyzing Space Invaders. Using the 16x A LOT grid to add the second alien. 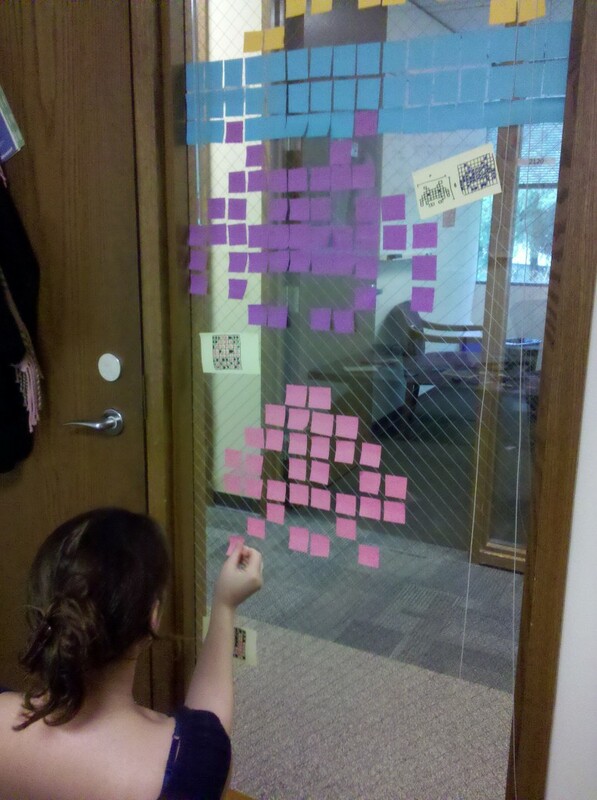 It turns out that making a post it note mural is actually a lot easier than one might think. I’d advise making your grid first, and figuring out a way to cut post it notes into better small squares if necessary (ours weren’t precisely straight).